Paco and I saw this beautiful rainbow chard at the farmers’ market and couldn’t resist. YUM. I was inspired by a couple of recipes, this one from Epicurious and this one from Smitten Kitchen, to combine Swiss chard, bacon, and garlic chips. Bring a large pot of salted water to a boil. Begin to prepare the spaghetti according to the package directions, draining when al dente. Before draining the pasta, reserve one cup of the starchy cooking water. In a large skillet, cook the bacon over medium heat until the fat has rendered out and it is crispy. Remove the bacon and drain over paper towels. Pour the excess fat from the skillet. Add the olive oil to the skillet, then add the garlic chips. Cook them until they are golden, but make sure to remove them before they burn. Drain them alongside the bacon. Add more olive oil to the skillet, then add the red pepper flakes. When the red pepper sizzles a little bit, add the chard. Cook until it wilts, seasoning with salt and black pepper. Add the balsamic vinegar and 1/2 cup of the starchy cooking water to the pot, then add the pasta and cheese. Toss together. Add more liquid if necessary. Sprinkle the garlic chips and bacon over the pasta, then serve with additional cheese. This is the perfect quick meal for a cold night. 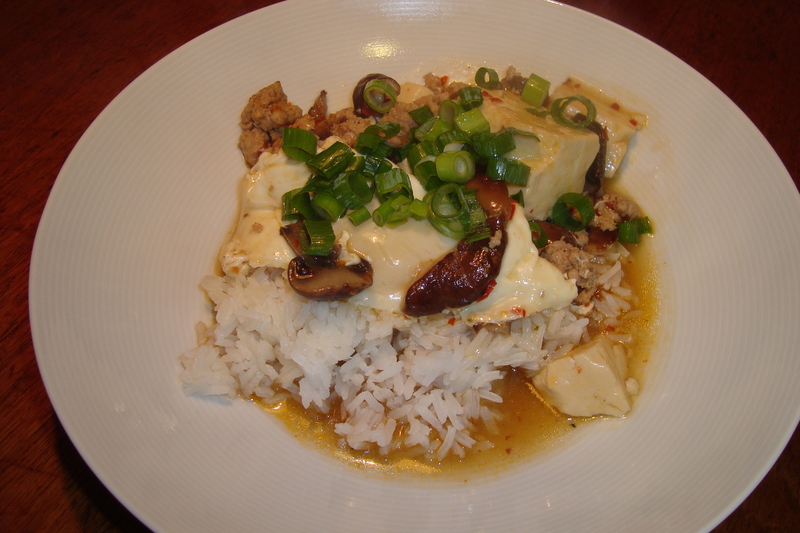 I used ground chicken because I had it on hand, but thinly sliced beef would be more traditional. This could easily be vegetarian, as well, just add some extra mushrooms. Heat the oil in a pot over medium-high heat. Brown the meat and season with salt and pepper. Add the garlic and mushrooms, and saute for a minute or two. 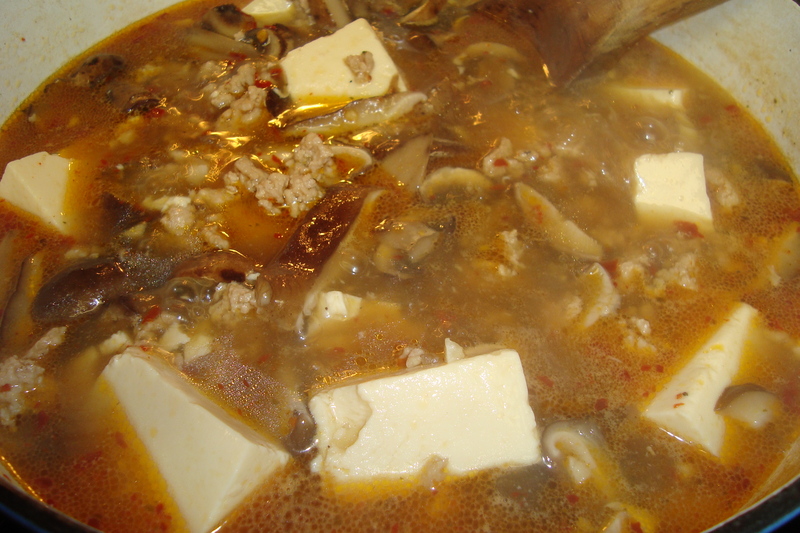 Add the chili flakes, soy sauce, and broth. Bring a boil, reduce to a simmer, and simmer for 15 minutes. Taste for seasoning. Add the tofu and stir. Gently crack the eggs into the pot, lightly basting each with hot broth. When the whites are cooked, gently ladle the stew out into individual portions over rice. Drizzle with sesame oil and sprinkle green onions over the top. My dad has been giving us a lot of mangoes lately, and Paco recently decided they are his favorite fruit. 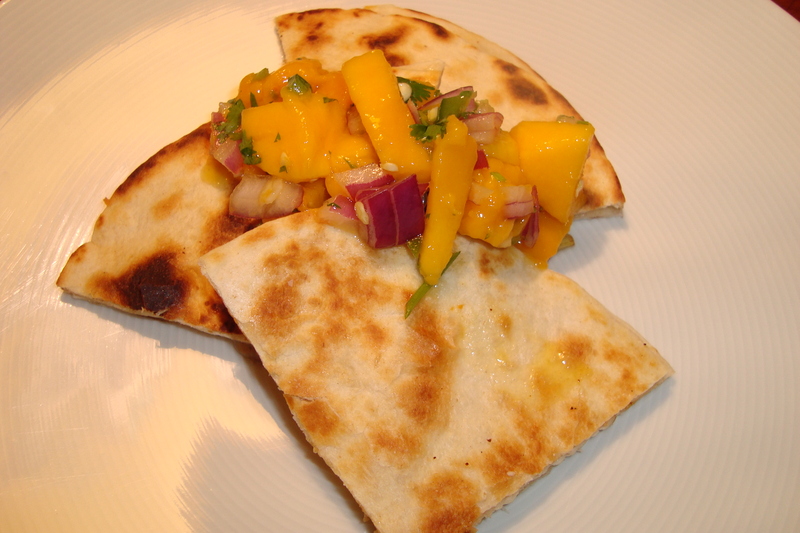 With the surplus of mangoes, we’ve been making mango salsa! 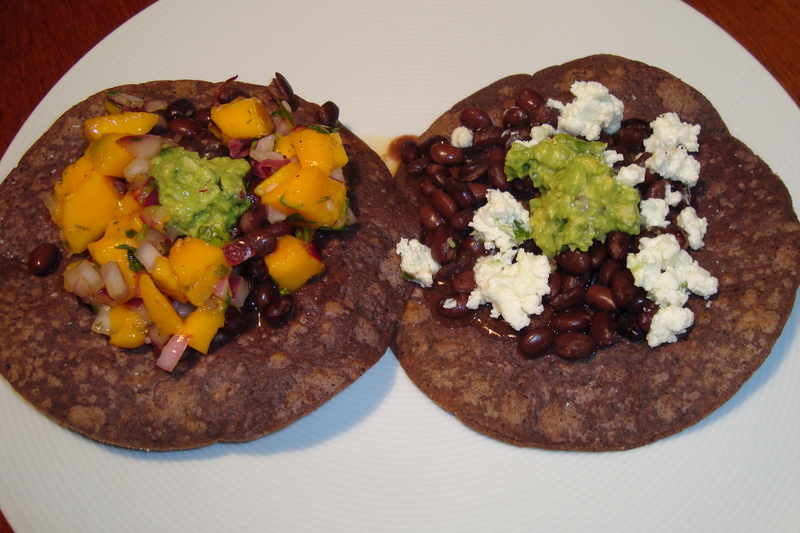 It is great on quesadillas or tostadas, as shown here. Combine all ingredients in a medium-sized bowl. For best results, prepare the salsa about 30 minutes before serving so that the flavors have a chance to meld together. Beef with broccoli is not something that I would typically order at a Chinese restaurant. The sauce can be heavy, and I prefer my broccoli on the crisp side. However, I love homemade beef with broccoli! I always use the recipe from The Steamy Kitchen Cookbook, which advises you to steam the broccoli separately then toss it with the sauce. It’s a great way to make sure that your broccoli remains bright green and perfectly cooked! Combine the marinade ingredients, then marinate the beef for 15 minutes. 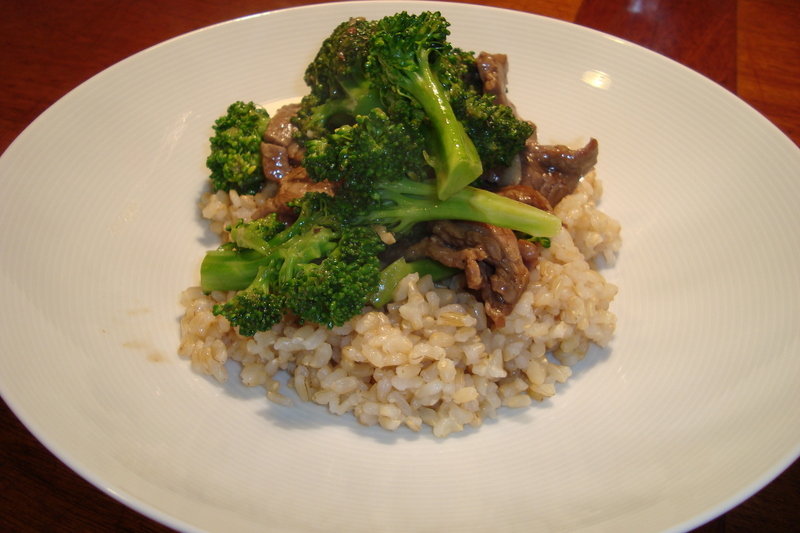 To steam the broccoli, place it in a microwavable bowl with an inch of water and season with salt. Cover with a plate. Microwave it on high for 2-3 minutes, until the broccoli is tender but still a little bit crunchy. Drain the broccoli and rinse it with cold water. Heat the oil in a large saute pan or wok over medium high heat. Add the garlic and beef in a single layer, and brown the beef on both sides. Add the stir-fry sauce, and cook until the sauce is a little bit thick. Finally, add the cooked broccoli to the pan and toss in the sauce. 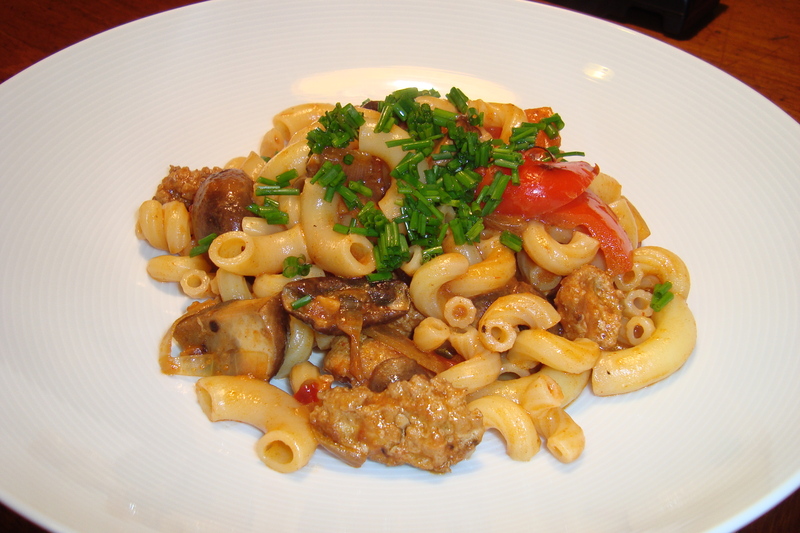 I have been making a version of Rachael Ray’s goulash for years. It’s quick, tasty, and Paco and I both love it. I usually use ground turkey, but I’ve used ground chicken and ground beef, and all versions are delicious. I usually lower the meat to vegetable ratio, but the great thing about this recipe is that you can modify it any way that you’d like. Heat the olive oil in a large skillet over medium heat. Add the ground turkey, and cook until browned. Season with salt. 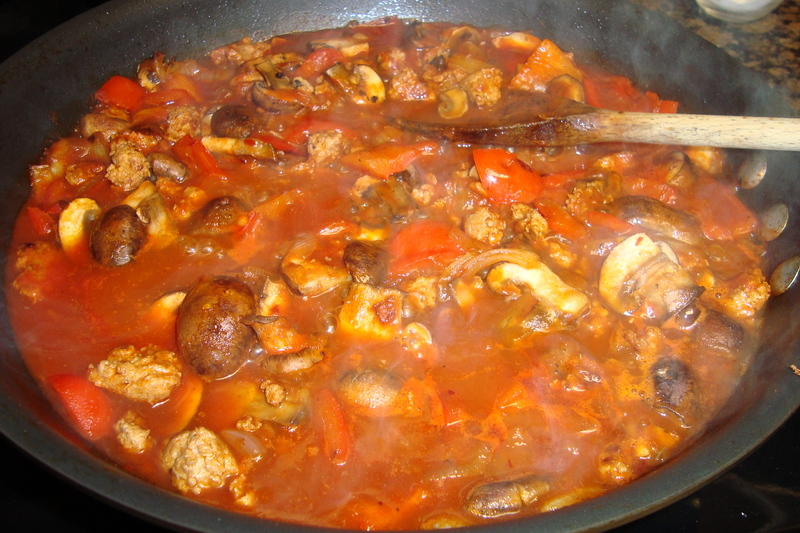 Add the bell pepper, onions, mushrooms, and garlic, then continue to cook for five minutes. Season with salt, pepper, and smoked paprika. Add the tomato sauce and water, stir, and bring to a simmer. Simmer for 5-10 minutes, taste, and adjust seasoning. Turn off the heat, stir in sour cream, and garnish with chives. Add the prepared macaroni and toss to coat with sauce.